SAN JUAN — City Commissioner Raudel “Raudy” Maldonado announced Tuesday he will run for Hidalgo County Treasurer in the March 2018 primary as a Democrat. Maldonado has held the Place 4 seat on the San Juan City Commission since June 2015 and his term runs through May 2019. His campaign manager, Selina Hayes-Medrano, said Maldonado would resign from the commission if elected treasurer. 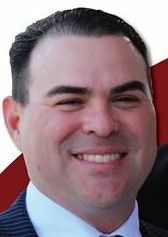 Maldonado previously worked at the Hidalgo County Clerk’s Office, the Texas General Land Office and was executive director of the Hidalgo County Democratic Party, according to a news release announcing his candidacy. Incumbent Hidalgo County Treasurer Norma Garcia is not seeking re-election.